The versions on this page were made in provincial dialects for Prince Louis Lucien Bonaparte by various "translators." In addition to Herbert's Catalogue, references are given for A Catalogue of all the Publications (as far as they can be traced) of the Late Prince Louis-Lucien Bonaparte... by Victor Collins, 1902. A copy of Collins' bibliography can be found on google. Some of these dialect versions are included in the work The Song of Solomon in Twenty Four English Dialects on google. For sample verses from Bonaparte's Dialect Versions, click here. References: Collins 70; Herbert 2513, Tulloch p. 20-26, Taliaferro-EELBV 0060.100. References: Collins 66; Herbert 2514, Tulloch p. 29-30, Taliaferro-EELBV 0060.105. Facsimilies: A PDF facsimile is available at www.archive.org. References: Collins 67; Herbert 2515, Tulloch p. 30-31, Taliaferro-EELBV 0060.115. Facsimile: A PDF facsimile is available at HathiTrust. Title: The Song of Solomon in Lowland Scotch; from the authorised English version, by Joseph Philip Robson. References: Collins 68; Herbert 2516, Tulloch p. 31-34, Taliaferro-EELBV 0060.180. Title: The Song of Solomon in Lowland Scotch; from the authorised English version. References: Collins 69; Herbert 2517, Tulloch p. 34-35, Taliaferro-EELBV 0060.182. 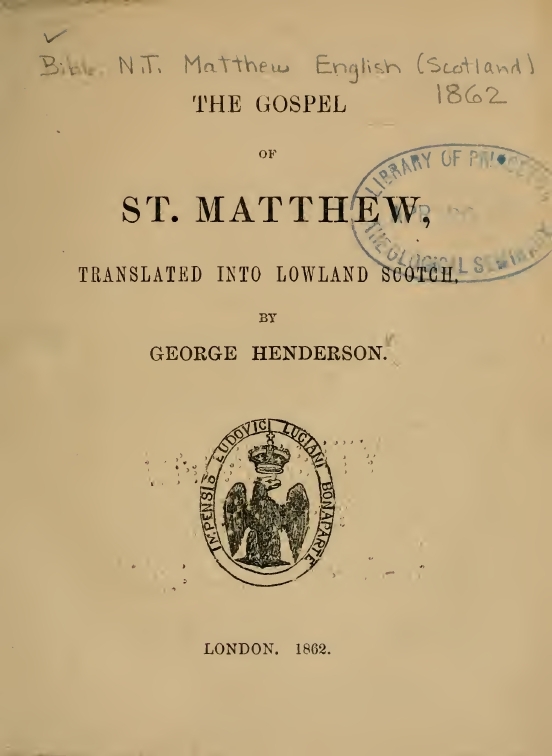 Title: The Gospel of St. Matthew, translated into Lowland Scotch, by George Henderson. References: Collins 114; Herbert 2519, Tulloch p. 26-29, Taliaferro-EELBV 0060.235. 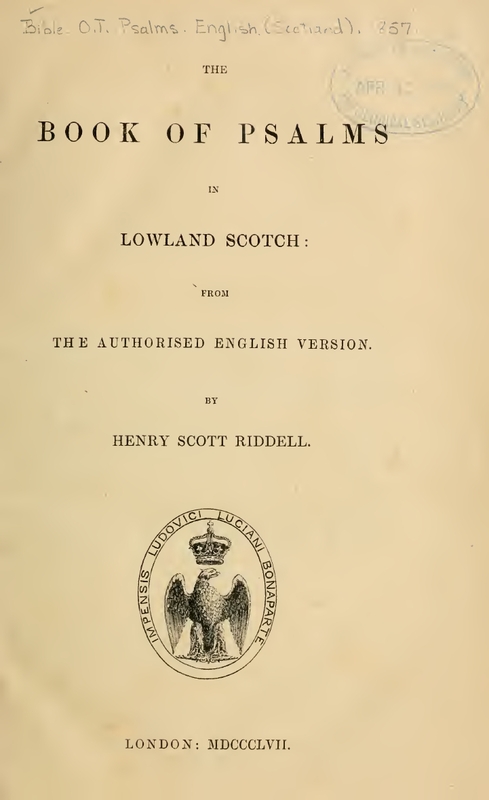 Title: The Song of Solomon in Lowland Scotch, from the authorised English version, by George Henderson. References: Collins 113; Herbert 2518, Tulloch p. 35-36, Taliaferro-EELBV 0060.240. References: Collins 76; Herbert 2487, Taliaferro-EELBV 0060.110. References: Collins 91; Herbert 2508, Taliaferro-EELBV 0060.125. Title: The Song of Solomon in the living Cornish Dialect; from the authorised English version. References: Collins 93; Herbert 2486, Taliaferro-EELBV 0060.135. References: Collins 74; Herbert 2501, Taliaferro-EELBV 0060.120. Title: The Song of Solomon in the Newcastle Dialect; from the authorised English version, by Joseph Philip Robson. References: Collins 75; Herbert 2502, Taliaferro-EELBV 0060.155. Title: The Song of Solomon in the Sheffield Dialect; from the authorised English version, by Abel Bywater. References: Collins 84; Herbert 2512, Taliaferro-EELBV 0060.160. Title: The Song of Solomon in the Devonshire dialect; from the authorised English version, by Henry Baird. References: Collins 86; Herbert 2489, Taliaferro-EELBV 0060.170. 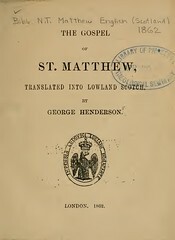 Title: The Gospel of St. Matthew, translated into Western English as spoken in Devonshire, by Henry Baird. References: Collins 126; Herbert 2490, Taliaferro-EELBV 0060.250. Title: The Song of Solomon in the Norfolk dialect; from the authorised English version, by the Rev. Edward Gillett, vicar of Runham. References: Collins 95; Herbert 2498, Taliaferro-EELBV 0060.185. 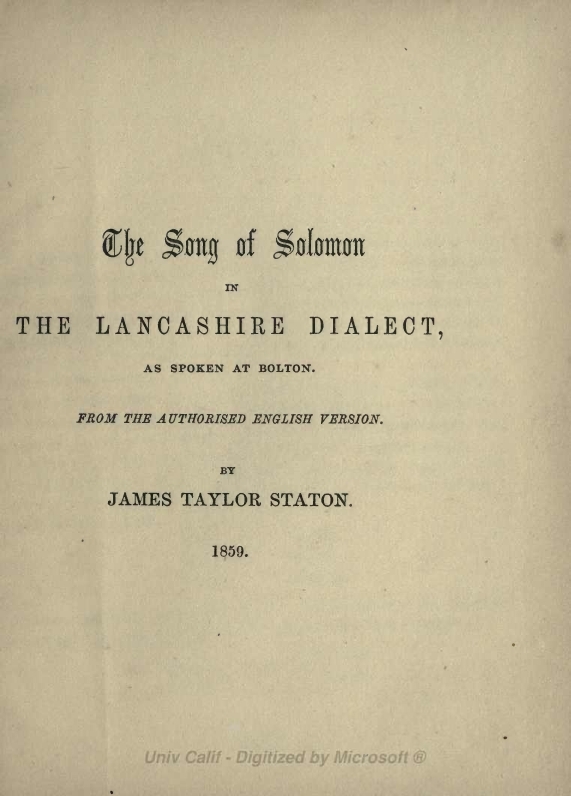 Title: The Song of Solomon in the North Lancashire dialect, as spoken north of the Wyre; from the authorised English version, by James Phizackerley. References: Collins 82; Herbert 2494, Taliaferro-EELBV 0060.190. Title: The Song of Solomon in the North Yorkshire dialect; from the authorised English version, by the author of `A glossary of Yorkshire words and phrases collected in Whitby and the neighbourhood. References: Collins 80; Herbert 2509, Taliaferro-EELBV 0060.195. Title: The Book of Ruth in the Northumberland dialect; from the authorised English version, by J. P. Robson. References: Collins 71; Herbert 2499, Taliaferro-EELBV 0060.200. 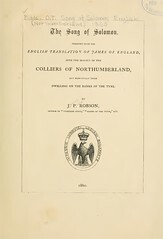 Title: The Song of Solomon in the Northumberland dialect; from the authorised English version, by Joseph Philip Robson. References: Collins 72; Herbert 2500, Taliaferro-EELBV 0060.205. 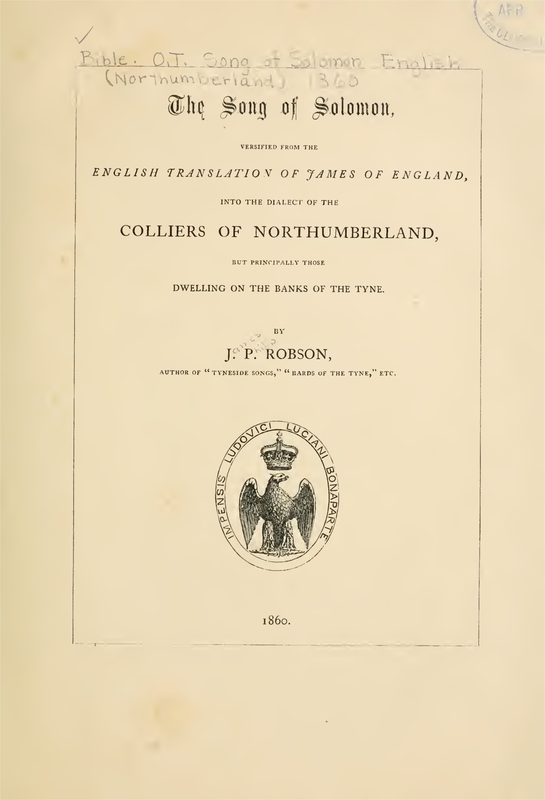 Title: The Song of Solomon, versified from the English translation of James of England into the dialect of the colliers of Northumberland, but principally those dwelling on the banks of the Tyne, by J. P. Robson. References: Collins 73; Herbert 2503, Taliaferro-EELBV 0060.210. Title: The Song of Solomon in the Somerset dialect; from the authorised English version, by T. Spencer Baynes, L.L.B. References: Collins 88; Herbert 2504, Taliaferro-EELBV 0060.215. Title: The Song of Solomon in the dialect of Sussex; from the authorised English version, by Mark Antony Lower, M.A., F.S.A. References: Collins 94; Herbert 2505, Taliaferro-EELBV 0060.220. 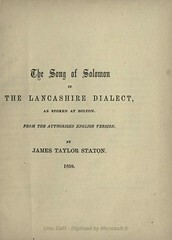 Title: The Song of Solomon in the West Riding of Yorkshire dialect; from the authorised English version, by Charles Rogers. References: Collins 83; Herbert 2510, Taliaferro-EELBV 0060.225. Title: The Song of Solomon in the Wiltshire dialect; as it is spoken in the northern division; from the authorised English version, by Edward Kite. References: Collins 91; Herbert 2508, Taliaferro-EELBV 0060.230.